Toshiba Canvio Advance Hard Drive 2 TB External (Portable) USB 3.0 - BlueThe Canvio Advance portable hard drive allows creators to do what they do best - anywhere their lives take them - offering high storage capacity, 24/7 access to your stored content and the time-tested reliable performance they need. Whenever and wherever creativity strikes, Canvio Advance offers the space to create. The Toshiba Canvio Advance provides up to 3TB1 of storage so you can store thousands of pictures, videos, music, or a variety of large files on a small 2.5-inch portable drive. The new Toshiba Canvio Advance features a minimalist design as well as clean edges, a sleek, high-gloss surface, and color options to inspire you - it's your life, your style, your speed. 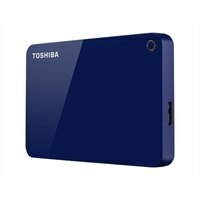 These new durable external hard drives are built to Toshiba's world-class quality standards. Access all of your stored content 24/7 easily from the Canvio Advance hard drive.